I am pleased to conduct another macaron class at ToTT and this time, it is Christmas themed :). Snowflake coconut macarons that have a lower sugar content! Please register for the class over here if you are interested. 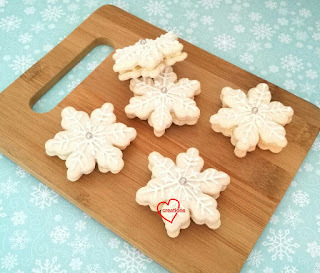 I will be teaching the Swiss meringue method, how to pipe snowflake shaped macarons, decorate the shells with royal icing post-baking and filling with coconut white chocolate ganache. My tastetesters at home all gave a thumbs up ;). Even when Christmas is over, these macarons are great for any Frozen themed parties too. Do sign up as soon as you can as places are limited.